The kids are finally out of school and all I want to do is sleep and let the kids fend for themselves. Unfortunately, teenagers really aren’t as self-sufficent as you would think and, left to their own devices, meals would consist of quesadillas, mac and cheese from a box and cookies (at least, they make those from scratch). Even with one daughter attending daily swim practices and lifeguarding and another daughter with a full-time job, they’re still at home a lot and always looking for food. Being a mom, I try to make that food be good food. Being a semi-working mom, I try to make that food be easy food. 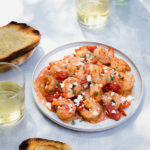 This recipe for garlic shrimp with oregano and feta does both. I’ve used all the shortcuts for this recipe so you can have this meal done in less than 30 minutes. Buying peeled and deveined shrimp, using cherry tomatoes (rather than big tomatoes that need to be chopped), and using a garlic press or mincer means hardly any prep work. Everything cooks up in one pan so clean up is pretty easy too. Serve this with slices of crusty bread that have been brushed with olive oil and lightly toasted to sop up the lovely sauce and dinner is done. Make the teens bake cookies after dinner and dessert is done too. In a large non-stick skillet, heat 1 tablespoon olive oil over medium-high heat. When the oil is shimmering, add half the shrimp and cook undisturbed until undersides are golden brown, 1-2 minutes. Turn shrimp over and cook until shrimp are pink and opaque, about 30 seconds more. Repeat with another tablespoon of olive oil and remaining shrimp. Transfer shrimp to a plate. Set aside. Add remaining 1 tablespoon of olive oil to the pan and heat over high heat. Add garlic and red pepper flakes and cook until fragrant, stirring constantly. Add the wine and cook until almost all the liquid is evaporated, 30-60 seconds. Add the tomatoes and a generous pinch of kosher salt. Cook, stirring occasionally, until the tomatoes start to burst, 6-7 minutes. Using a potato masher or the back of a spatula, mash the tomatoes so they break down into a sauce. Reduce heat to low. Stir in dried oregano and reserved shrimp and any accumulated juices. Stir to combine. Season with salt and pepper to taste. Stir in half the feta so the cheese begins to melt into the sauce. Sprinkle remaining cheese on top. Garnish with fresh oregano leaves and serve. Recipe adapted from Milk Street.